Welcome! We invite you to browse our website, located at www.tapgrowthadvisors.com (the “Site”), which is owned and operated by TAP Growth Advisors, LLC (“TAP Growth Advisors,” “we,” “us,” “our,”). This Site contains information about our company, our services, and our mission. TAP Growth Advisors, LLC and The Acceleration Project, Inc. are separate businesses founded by Jane Veron and Lisa Tretler. TAP Growth Advisors, LLC is a for-profit limited liability company formed under the laws of the State of Delaware. 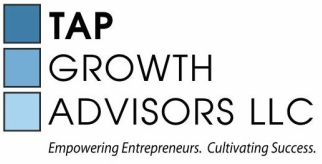 TAP Growth Advisors, LLC provides one-on-one strategic advice, workshops, and group discussion forums to women seeking to re-enter the workforce as entrepreneurs, consultants or volunteers. The Acceleration Project, Inc. is a nonprofit corporation formed under the laws of the State of Delaware, and is a tax-exempt organization under Section 501(c)(3) of the Internal Revenue Code. The Acceleration Project, Inc. provides structured, results-oriented, pro bono business consulting to local small businesses, drawing on the skills of women to make a meaningful impact in their communities while advancing their professional skills. By accessing and/or using the Site, you agree that you will not: (a) impersonate any person, business or entity, including our company and our employees and agents; (b) encourage conduct that would constitute a criminal offense or give rise to civil liability; (c) use automated means, including spiders, robots, crawlers, data mining tools, or the like to download or scrape data from the Site, except for Internet search engines (e.g., Google) and non-commercial public archives (e.g., archive.org); (d) use the Site for any unlawful purpose or malicious activity, as determined by TAP Growth Advisors in its sole and absolute discretion; (e) interfere with or attempt to interrupt the proper operation of the Site through the use of any virus, device, information collection or transmission mechanism, software or routine, or access or attempt to gain access to any data, files, or passwords related to the Site through hacking, password or data mining, or any other means; or (f) cover, obscure, block, or in any way interfere with any advertisements and/or safety features (e.g., report abuse button) on the Site. We reserve the right, in our sole and absolute discretion, to deny you access to the Site, or any portion of the Site, without notice. The trademarks, service marks, and logos of TAP Growth Advisors (“TAP Growth Advisors Trademarks”) used and displayed on the Site are registered and unregistered trademarks or service marks of TAP Growth Advisors. Other company, product, and service names located on the Site may be trademarks or service marks owned by others (the “Third-Party Trademarks,” and, collectively with TAP Growth Advisors Trademarks, the “Trademarks”). Nothing on the Site should be construed as granting, by implication, estoppel, or otherwise, any license or right to use the Trademarks, without our prior written permission specific for each such use. Use of the Trademarks as part of a link to or from any site is prohibited unless establishment of such a link is approved in advance by us in writing. All goodwill generated from the use of TAP Growth Advisors Trademarks inures to our benefit.